Manufacturers: Find out how a TDmonthly Video attracts buyers. This 18”-tall turkey puppet needs only a hand to come alive. Designed in multitextured and multihued plush, it's a true representation of the cherished American icon. Featuring a one or two-handed design, the turkey's tail displays proudly. Launch date: August 2007. Dolly Licorice is a 10” vinyl doll with a cloth body and black hair. She’s dressed in bright colors with striped stockings and a pink streak running through her hair. Launch date: January 2008. Rabbit "Hoppel" #5090 by KÖSEN USA, Inc.
Other products from KÖSEN USA, Inc. 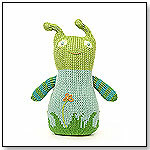 Handmade in Germany, this rabbit is created as close to nature as possible and is 7.1" long. Its exterior consists of high-quality woven fur and leather imitation. All KÖSEN plush animals conform to the highest safety standards. The materials, products and production are inspected by TÜV and meet all requirements of the European safety standard for toys, EN 71. Children may even keep this toy beyond childhood, to eventually pass on to their own children. 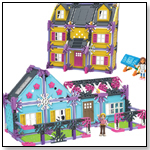 The product received a 2008 Toy of the Year Award from Creative Child Magazine. Launch date: 2001. Display Ideas: Group animals by natural habitat or geographical area. Firefighter Art Smock by KIDZSMOCKS INC. This firefighter art smock's design includes the suspender overalls of a typical firefighter, but not its fire retardant jacket. It is 100% waterproof and can be fastened on from the back with Velcro. 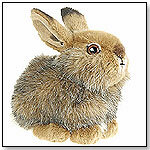 Naturally Better Plush: Peter Rabbit, Flopsy, Mopsy & Cotton-Tail by KIDS PREFERRED INC. These plush toys by Kids Preferred are made from 100-percent organic materials and are the first products in the Peter Rabbit...Naturally Better line. Each super-soft toy, dressed in a monogrammed outfit to identify the character, comes in a recyclable, reusable and PVC-free display/gift box. Peter stands 18" tall and carries a carrot. Launch date: June 2008. These 11" stuffed animal babies are wrapped in a removable blanket, that features a plush decorative velcro closure. 27 styles available from teddy bears, jungle animals, woodland creatures, and sea life. Discovery Cube Colorful World by HABA USA/HABERMAASS CORP.
Charming play cube awakens all of the senses and entices curiosity! 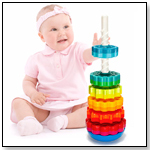 Each cube keeps the little ones occupied thanks to their optical and acoustic elements and the different features to pull at, turn or touch. Colorful World has magnetic blue, pink and orange flaps, and a peephole with kaleidoscope. Boogaloos are adorable, rounded creatures that are soft, cuddly and funny. Handknit by a Peruvian artist, they are 100-percent cotton stuffed with polyfill and are designed to provide a simple and vibrant play experience. Launch date: 2008. This soft plush kangaroo puppet keeps her joey snugly tucked in her pouch. Launch date: 2008. The Kidzsack is a high quality, multifunctional, and durable bag with a screenprint that kids can color in using the 8 provided color markers. The Sea Life Kidzsack design includes common sea creatures such as a dolphin, stingray, and octopus. In this palm-sized package is a full size, clean, safe, portable, disposable, biodegradable potty that is truly a better way. It simply flips open and is ready to go. Pottyflip provides a quick dependable way to answer the universal call “I GOTTA GO.” It is easy to carry a Pottyflip in your pocket or purse. Keep one in the glove compartment of the car. Keep a spare in your diaper bag for playtime emergencies or while at the beach, lakes or parks. Use it, fold it back up, and dispose of the whole potty - no mess, no fuss. Use a clean new potty each time. 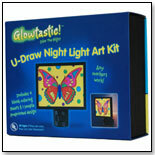 This kit allows kids of all ages to design their own works of art that can then be displayed in a fun-to-see light. Children can simply design and/or color their picture with any markers and then place it into the night light. Each kit comes with four blank coloring sheets plus a promotional, preprinted butterfly design coloring sheet. Replacement insert pages for the GLOWTASTIC! U-Draw Light Kit are also available. Soft Pink Pettidress by RACHEL ON THE FLOWER INC.
Other products from RACHEL ON THE FLOWER INC. This pink pettidress is made with extra soft nylon chiffon to allow for the dress to be extra fluffy. ZooPoo puts the FUN in functional. Tucked away inside each plush character is a refillable Shampoo (or Poo, if you will) tube so that the product can be applied by squeezing it out right on a little stinker. Launch date: 2009. The CALAFANT Castle is part of the CALAFANT cardboard kit line and is extra sturdy and easy to build. Children can decorate it any way they like and get really creative. Not only is it fun to decorate the castle, it's also a wonderful toy and a cool home for knights, kings, princesses and dragons. The toy is fully recyclable and won't take up space in a landfill. Launch date: January 4, 2008.